Japanese cuisine is so varied that to even fit the basics into one post would be a gargantuan task. So I will restrict myself to what I tried as part of the new Bento Box introduced by Monsoon at The Park Bangalore. The Bento Box is ahem…a box (sheepish grin), that holds a single portion meal of rice, cooked fish or meat along with pickled vegetables. It is the Japanese version of our lunch dabbas, albeit carefully prepared and presented (as is with everything Japanese)! I opted for the non-veg Bento and we started the meal with a Miso Soup. This is essentially a clear broth (Dashi – stock made with dried kelp, sardines, tuna or shitake mushrooms) spiked with Miso paste (generally fermented soy bean paste) topped off with your choice of ingredients. Here it was seaweed and bean curd. Now miso is an acquired taste (fermented things generally are – think stinky but also think Beer J). I personally love the salty, smokey, tangy taste of miso. 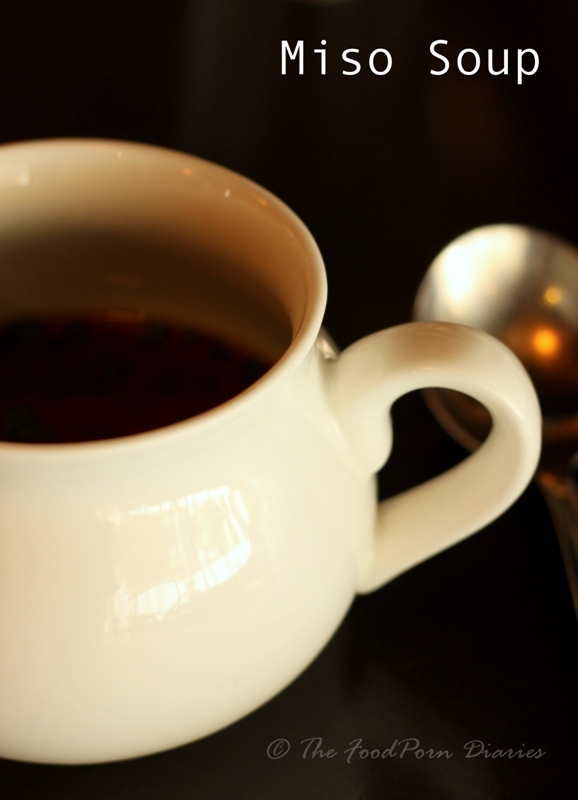 It is also known for the Umami it packs – essentially a flavor punch or as people like to call it ‘The sixth taste’. This is supposed to heighten all other tastes. The Bento Box arrived – a beautiful black lacquered box complete with a bright red lid. Red and Black can be such a striking combination! And then I opened it and smiled. Everything looked so fresh and pleasing to the eye. Our Bento box came lined with banana leaves and I’m not sure that is traditional, but it sure made the food stand out! Here is a quick lowdown on each of the elements. I tried the Sashimi first because I didn’t want the delicate flavors to be marred by other cooked/ sauced offerings in the box. Many people use Sushi and Sashimi interchangeably but there is a world of difference between the two. 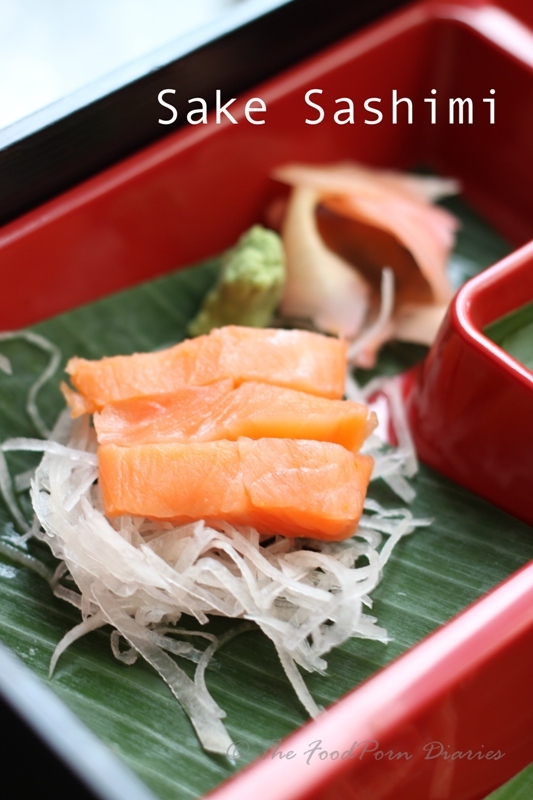 Sashimi refers to any preparation of raw fish. The fish needs to be absolutely fresh and slicing the fish itself is an art complementary to the serving of sashimi. The raw fish is then placed over a bed of garnishes – in this case, slivers of daikon or asian radish. You are served wasabi and soy sauce on the side along with pink pickled ginger. The Wasabi not only adds some heat to the fish, but is also believed to be useful in killing harmful bacteria and parasites that could be present in raw seafood. The Sake Sashimi here was a Salmon sashimi and I am happy to say it was absolutely fresh. The slices could have been a tad thinner, but that’s just a small gripe. Now, I’m no Japanese food expert so I can’t resolve the debate of whether to mix the wasabi with the soy or just dab the wasabi to the ends of the chopstick while savoring the sashimi. You can try both methods and tell me which one works for you! The sashimi whetted my appetite for some sushi. This is not a part of the Bento box, but we couldn’t resist. We tried two types of Sushi ordered from their new Japanese menu. 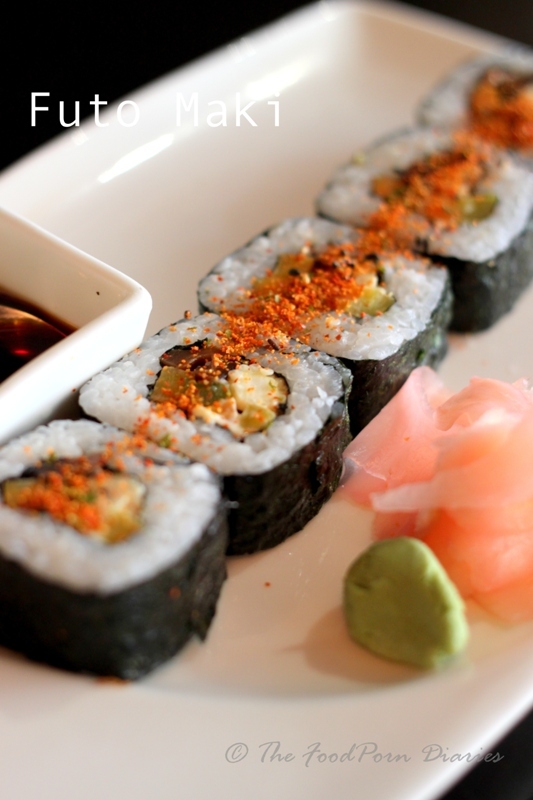 Sushi is simply – cooked vinegared rice with other ingredients. When it forms a bed for a piece of raw fish – it is called nigirizushi and when it is wrapped around ingredients – it is called makizushi. Makizushi itself has many types, but for the sake of the length of this post I will again restrict myself to what I ate. We tried the vegetarian Futo Maki. This is a also called a Fat roll because it is larger in size to the other sushi rolls. This type of roll falls into the category where the sushi rice is on the inside and is wrapped with seaweed. The rice holds different fillings like cucumber, avocado, bamboo shoots etc. The filling is generally chosen to ensure that when you cut the roll into slices – it looks colourful and enticing (of course care is taken to choose complementary flavors as well). The next type of sushi on order was the Uramaki. The difference being that the sushi rice is now on the outside and the nori on the inside! The restaurant called this the Spider roll and we were relieved to find that it was filled with soft shell spider crabs and not spiders. This one came decorated with fish roe and I couldn’t stop at one. 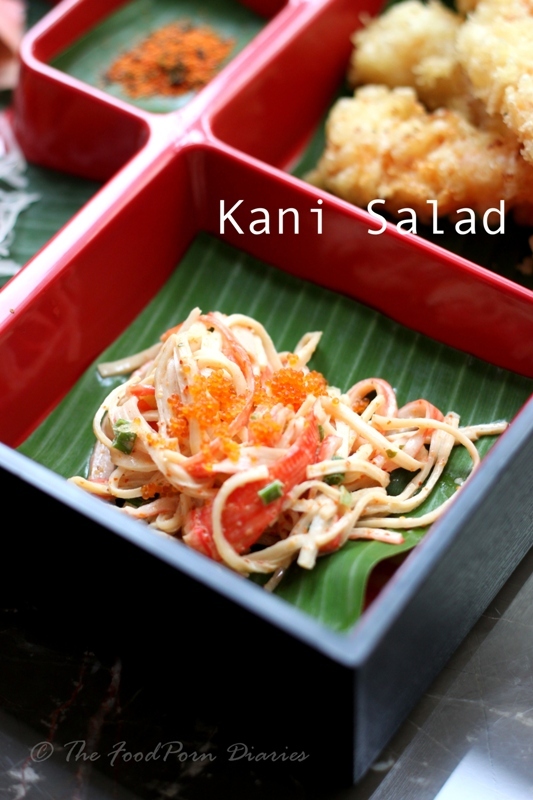 I got back to eating the Bento now and tried the Kani Salad. This was a crabstick salad dressed with Japanese mayo and sesame oil. 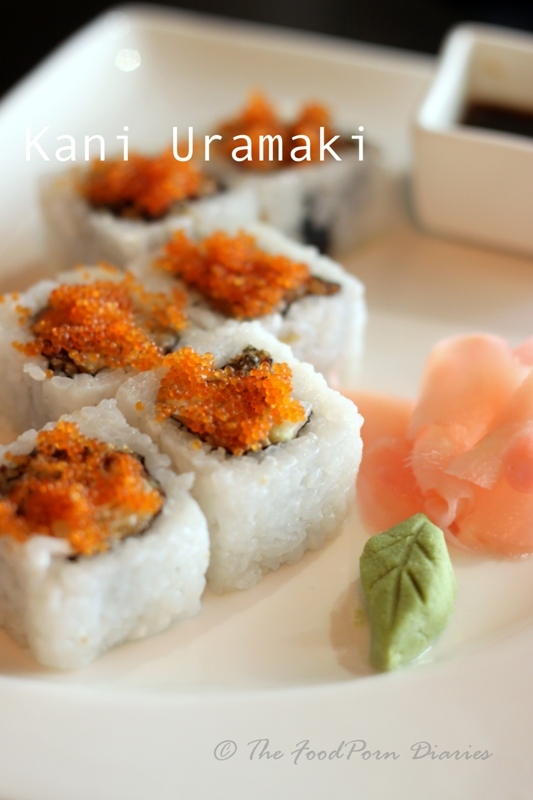 It also came highlighted with small orange fish roe which gave it crunch and texture. I also sensed a certain spice hitting my palate and was told that was ‘Shichimi Togarashi’ – and then my day took a most interesting turn. I loved the tangy, spicey, crunchy and slightly chaat like taste of this and was definitely intrigued to know if this was Japanese or just something that is added to make it appeal to the Indian palate which desires spice! 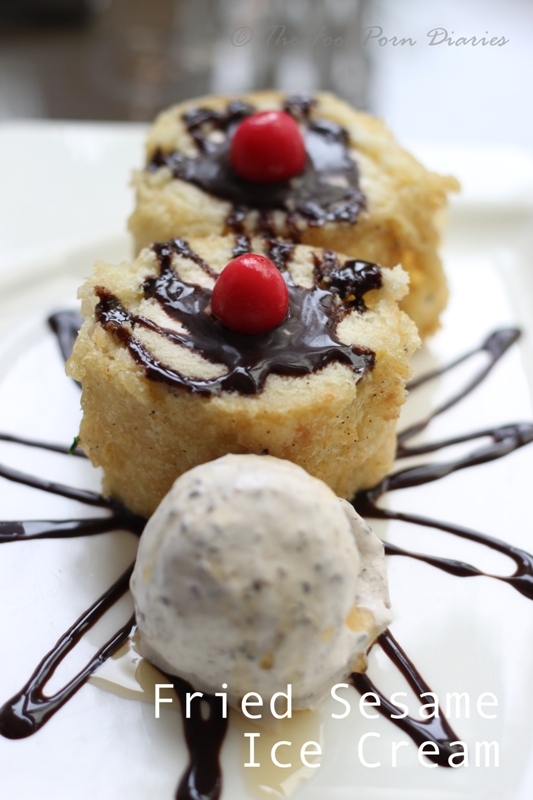 Tempura is something that everyone has a palate for – it’s deep fried! The trick with the Japanese deep fry is the extremely light batter that they use. The batter is made just a few minutes before the actual frying to ensure the gluten is not activated in the flour and the batter remains light but not chewy. 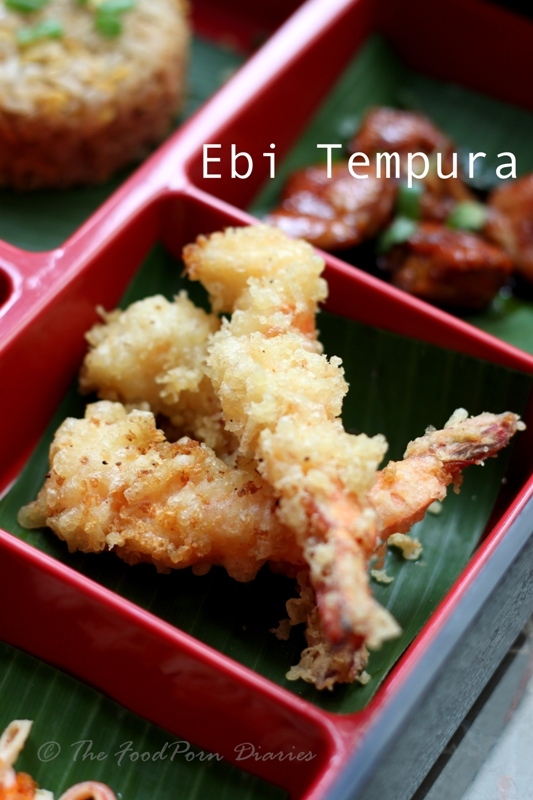 We had the Ebi Tempura or the Prawn Tempura. Three large, perfectly golden fried beauties – if only they had been a little light handed with the salt, it would have been perfect. 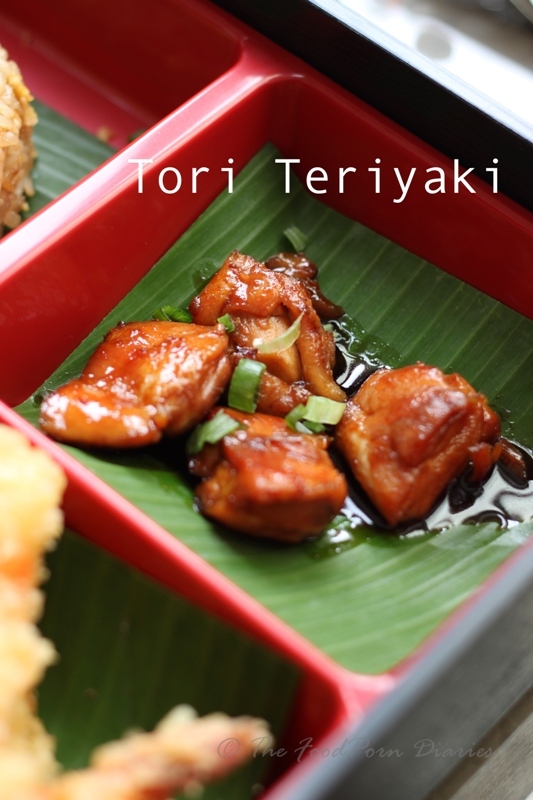 The Tori Teriyaki or Chicken in teriyaki sauce is a crowd favourite – most pan-asian restaurants make it a point to feature this on their menu. The technique involves yaki or basting the broiled meat with a marinade of soy, mirin and sugar resulting in teri or a glaze. Of course the Americans have reduced any dish with the teriyaki marinade as Teriyaki. 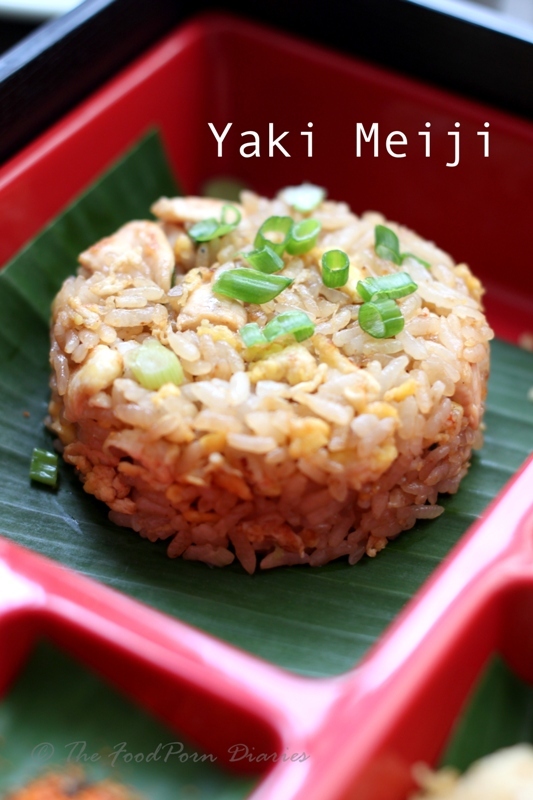 The accompaniment to the meats is a Yaki Meiji or fried rice with chicken and egg. The only difference to a regular fried rice is the addition of Japanese soy sauce, which is sweeter than the Chinese variety. We ended with a Fried Sesame Ice Cream. We ended with a Fried Sesame Ice Cream. This was the anti-thesis to the otherwise beautifully served bento. It felt out of place and garish compared to the elegance and simplicity of the rest of the dishes. I would recommend omitting the fried ice cream and just serving a beautiful scoop of the sesame ice cream in the future. If you have never tried Japanese food and you want a quick sampler of many things – the Bento is a good bet. If you love Japanese food and want a quick meal – the Bento is still a good bet! 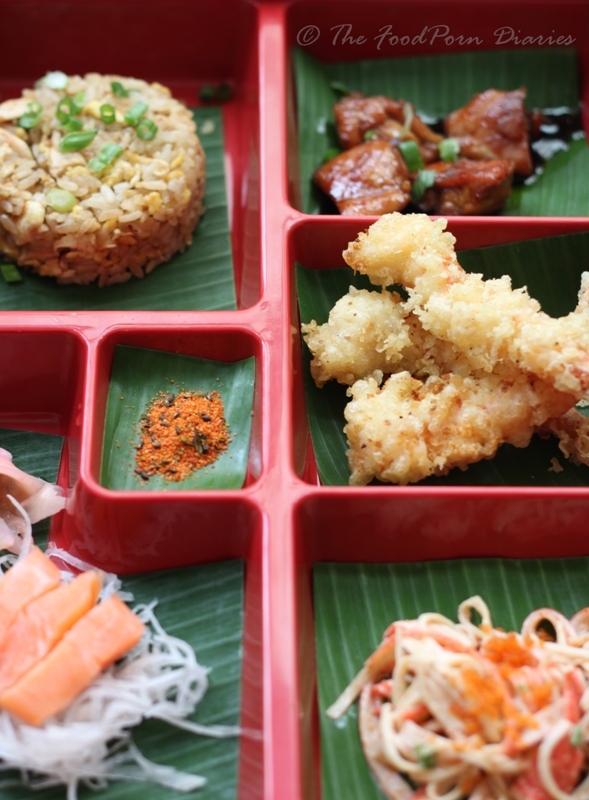 The Bento Box is served for lunch and dinner at Monsoon. It will leave your pockets lighter by Rs.1500/- for the non-veg Bento and Rs.1200/- for the veg Bento. You can order sushi on the side and the prices for that start from Rs.525/- for the veg and Rs725/- for the non-veg. (Prices are exclusive of taxes and service charge).